On this episode of Those Conspiracy Guys we talk about one of the best and worst kept secrets in modern American culture, a place for elites to go and shake off the shackles of their ultra stressful lifestyles with nefarious and satanic deeds; all nestled in the comfort of Northern California redwood forests, we are talking about Bohemian Grove. 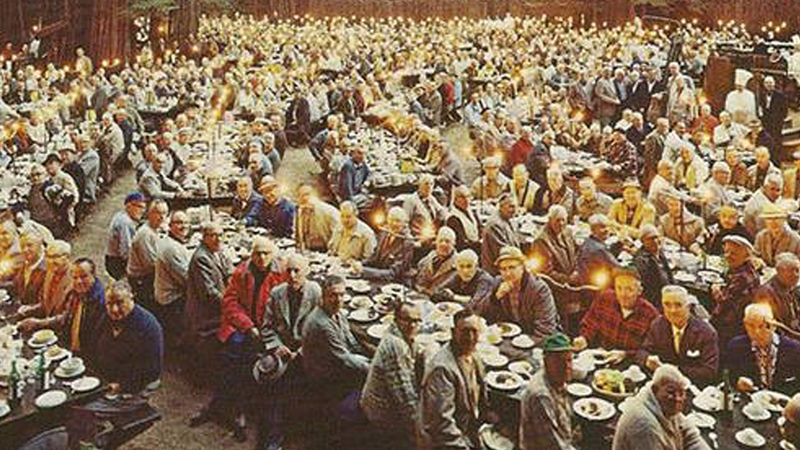 Bohemian Grove is a campground located in California that belongs to a gentlemen’s club started in 1878 and every summer the elite of the world gather to celebrate and allegedly partake in satanic rituals like burning effigies and sacrificing virgins all while discussing global business dealings and collaborating to take over the world. The inauspicious beginnings of the Grove were far from this however, as it was started by a group of bohemian entertainers as a camping weekend trip and was infiltrated by the good and great of San Fransisco society in the late 19th Century. Skull and Bones, The Order of Hubertus and the Rosicrucians, among many others, are some of the societies to be represented at Bohemian Grove during the summer festivities and details of former and future presidents and other global political dignitaries and famous actors, musicians and artists are also now public record.Accusations of controlling the world with these clandestine meetings are understandably frequent and the huge profile of the guests would lead an inquisitive mind to wonder what does go on behind closed doors.